Many are the books we read simple for diversion. A few hold our interest, or attention only once, while some we may reread. But rare is the book which becomes a companion for us throughout life. 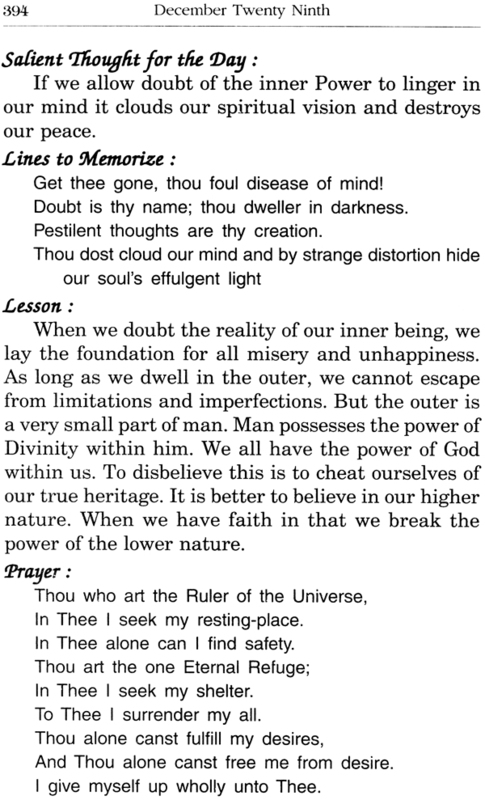 Scriptures and classics, whatever their language, claim immortality because these speak not merely to man’s mind or intellect, but primarily to his soul, awakening true spiritual awareness. For more than half a century (since its first appearances), this book has found its way unobtrusively into the hands of innumerable readers. 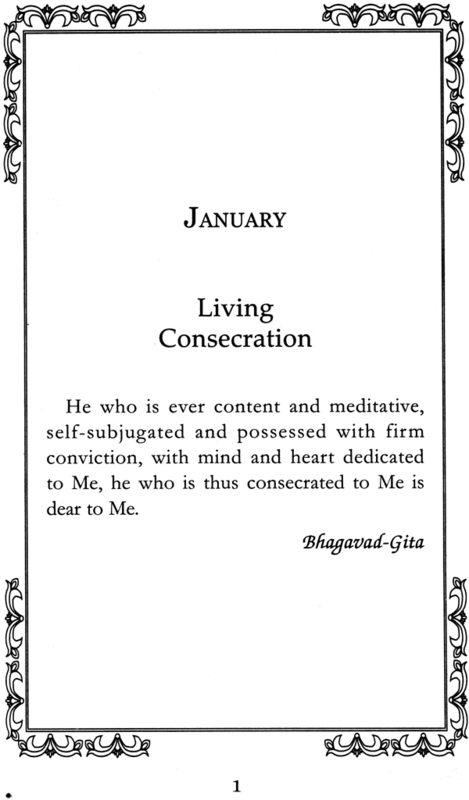 Throughout the 365 days of the year it gives guidance or stimulus, comfort or admonition, sustenance or insight to the genuine aspirant who seeks to practice his religion, whatever that may be, in his daily life. 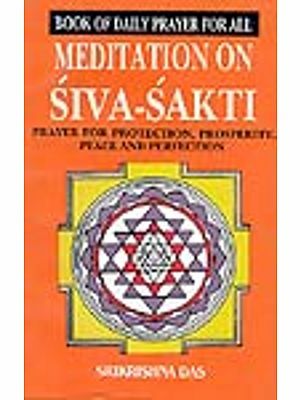 Each page, containing a salient thought, a poetic verse, a lesson, and a spontaneous prayer, testifies to the author’s inspired life and teachings. 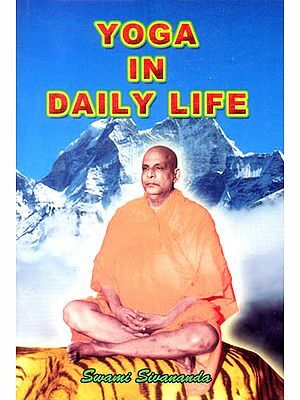 We who have been the heirs to Swami Paramananda’s spiritual mission are grateful to share with the English readers throughout the world this fifth edition of the Daily Thoughts and Prayers. There are moments when the spirit is mute and powerless to give utterance to its interior yearning. It feels the need of a vibrant word to rouse it from its numbness and voice its voiceless aspiration. 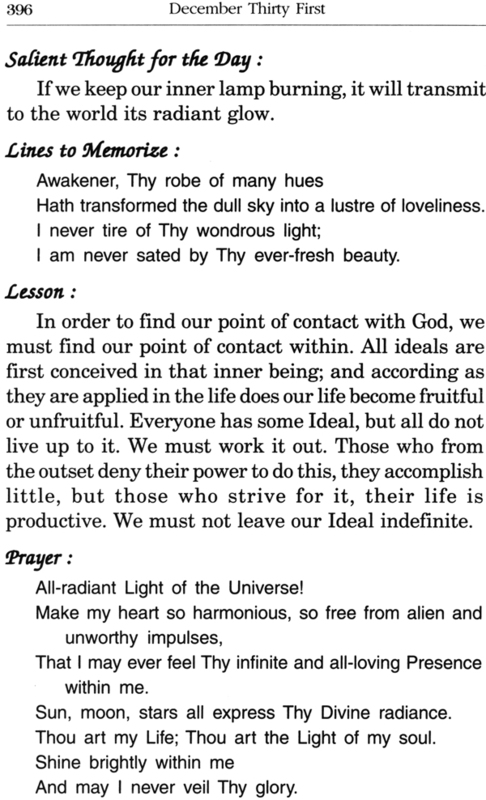 Hence attempts to provide, in one form or another, daily thoughts, for the day’s round are coincident with the rising of the religious consciousness. 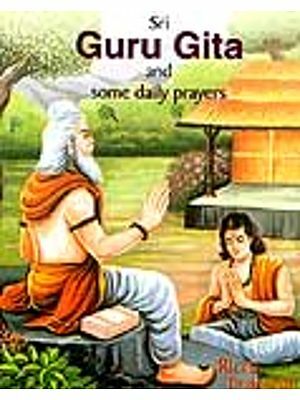 The ancient Forest-Book or Upanishads of the Vedic period were but the accumulated effort of great sages to help those who surrounded them in their woodland hermitage, to meet the daily problems with triumphant heart. The mediaeval breviaries and manuals of devotion were written or complied to the same end. 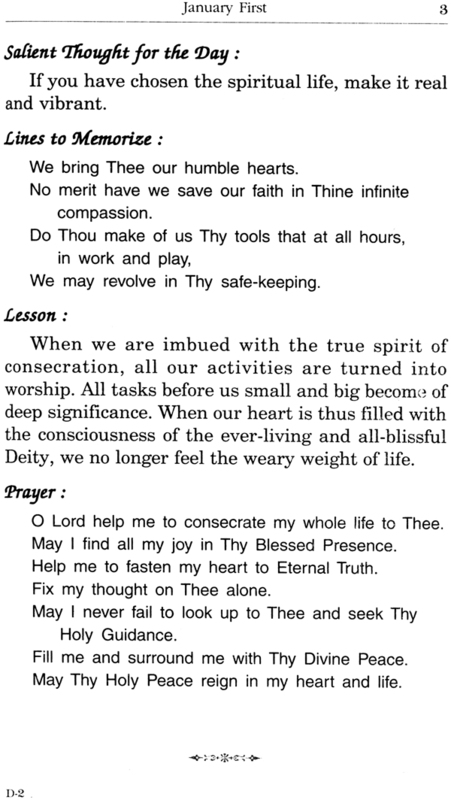 The present volume is another contribution to this daily sacrament of prayer and holy thought. The idea of preparing it is not of recent conception. As far back as 1912 Swami Paramananda wrote me from Switzerland: ‘Other day I was thinking a little of the next book-(from your letter). Can’t we call it “A Book of Daily thoughts and Prayers’? What do you think of it? 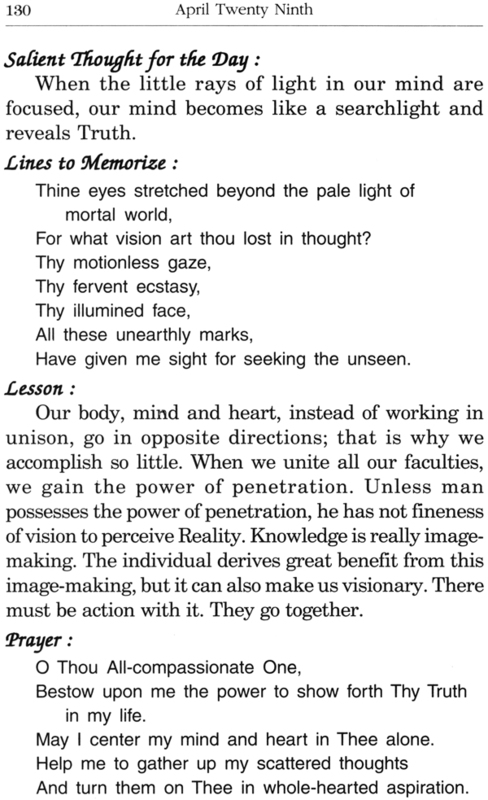 I had written to him that the idea had come to me to gather from his later letters and certain notes of his teaching material for a companion volume to the ‘Path of Devotion,’ made up from earlier letters. It was not possible, at the time, to carry out his new suggestion, as the book under preparation was practically ready for press when the suggestion came; but the intention remained with me and at last has assumed definite form. The present volume has lost nothing through the delay, for now it has a much richer store to draw upon. 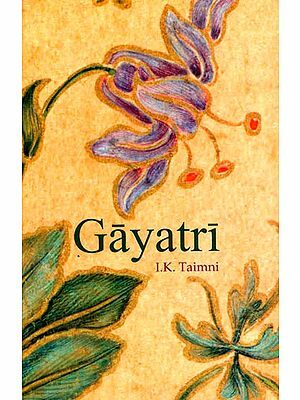 From year to year I have garnered stray thoughts jotted down on scraps of paper lying on the Swami’s desk or work table, or tucked in some book. I have noted vital saying and set aside countless passages from letters. 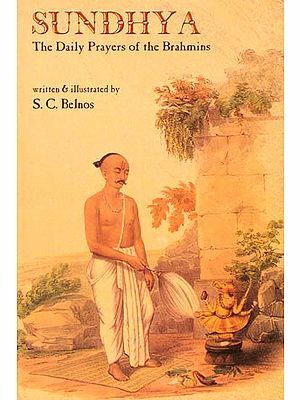 All the material used, except the lines taken from the Swami’s poems, has been drawn from unpublished source; chiefly from familiar instruction given to his household at the morning or evening meal; or from fragments of conversations, written down with groping hand and unseeing eyes on the terrace of the Ashrama in the moonlight , or by the flickerof a hearth-fire, or by the dim flame of a far-away candle. The prayers were caught with the same stealthy silent pencil at the moment of their utterance. They sound in consequences the more living note of spoken supplication. 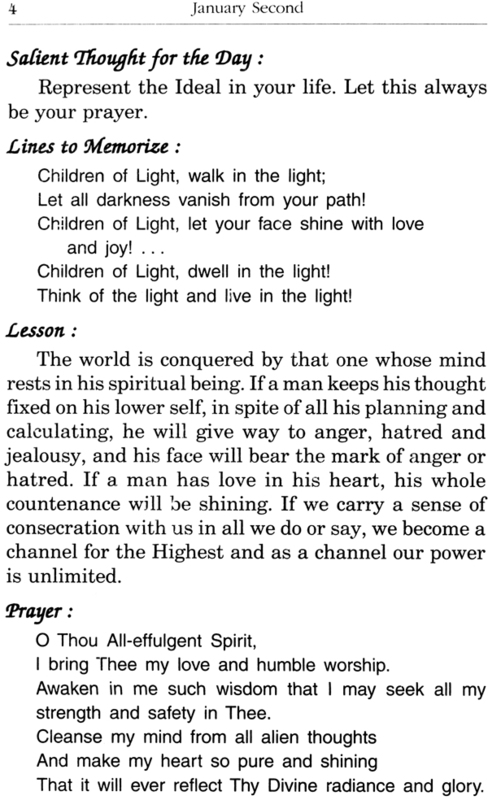 The quotations from the Scriptures are from the Swami’s translation. Coming from such intimate sources, the words which follow possess special helpfulness in the intimate inward striving of each day. They have been classified and arranged in consecutive and cumulative sequence. The thought is carried forward from day to day, so that at the end of a month a new and de fined impression will be made on the character. 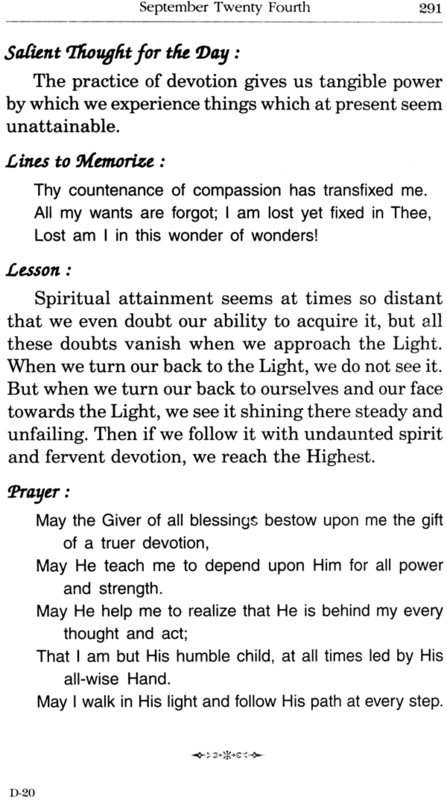 Each day brings its salient thought to be held through the waking hours in continuous mindfulness; a brief lesson amplifies this and imbeds it more deeply in the consciousness; a prayer feeds and strengthen the natural upward-reaching devotional aspirations of the heart. 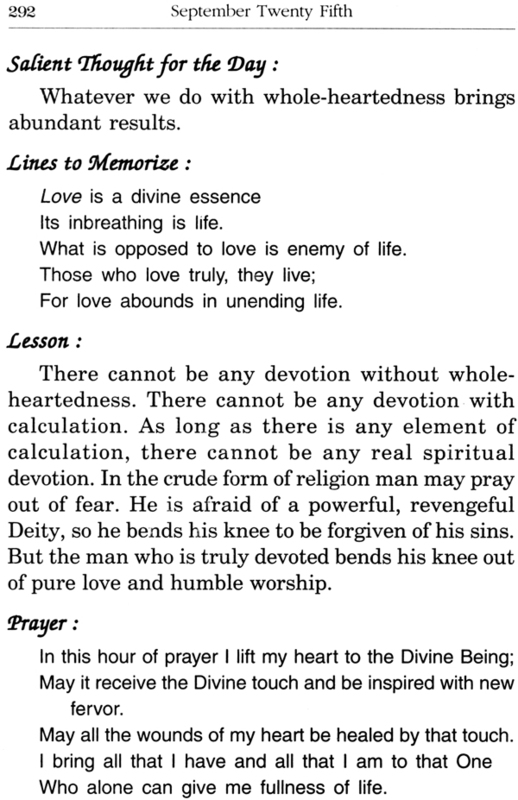 A few lines from the Swami’s sacred and illumined poems are given as a daily exercise in memorizing. 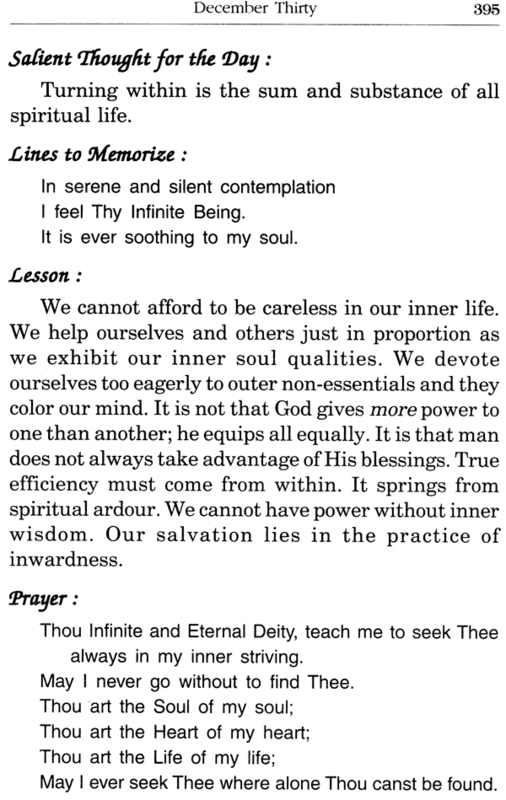 Memorizing is one of the most productive of spiritual practices. 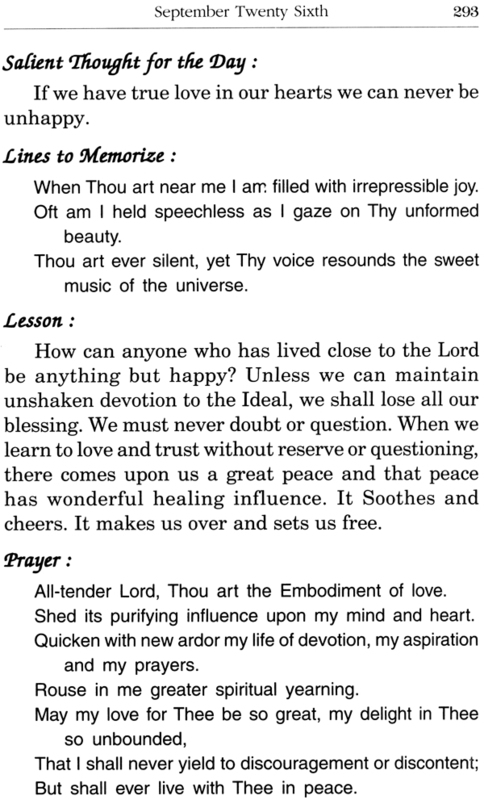 It provides a rich inner library to which one can turn in the moment of emptiness or distress. A single line called up in memory will sometimes turn the thought into an entirely fresh and wholesome channel. 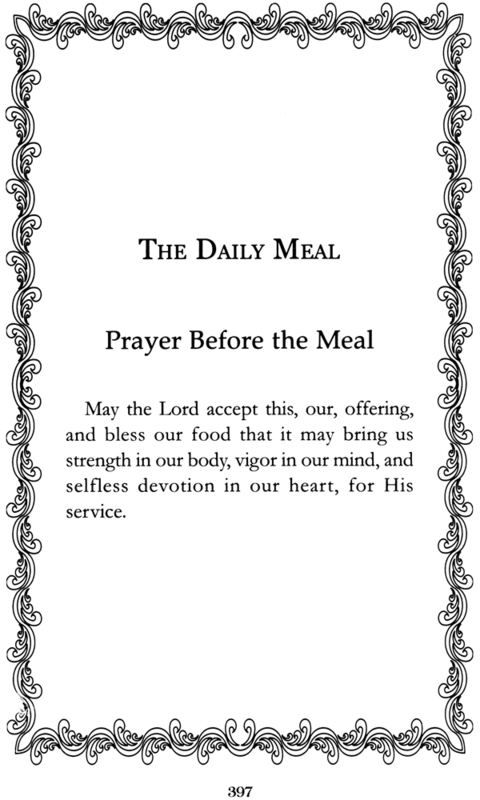 Thus on each page will be found food for all the faculties of the aspiring spirit. 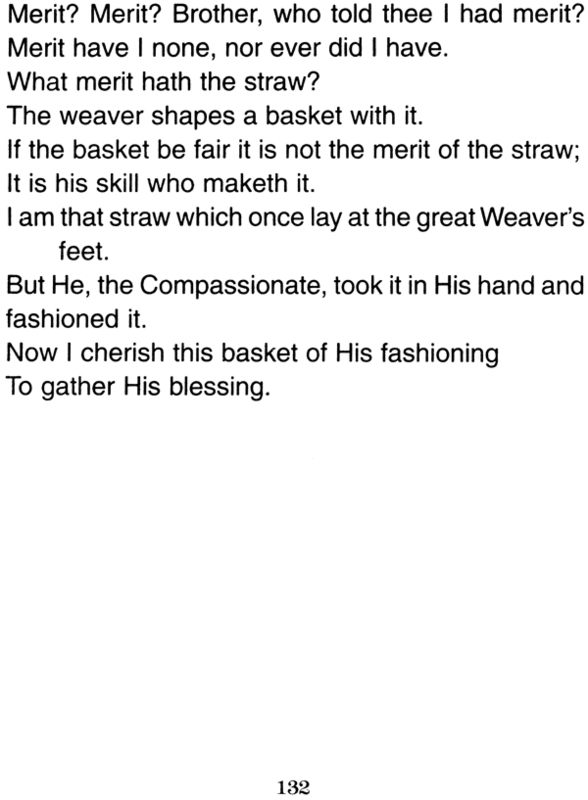 The Swami’s words lend themselves with peculiar aptitude to a work of this nature. His sentences have the focused, shining quality of a finely-cut gem which requires no embellishment of ornate setting. They stir the higher, holier impulses of the soul and impel to consecrated living. They carry forward by their inherent vitality and strength. The book calls for no other introduction than itself. With its tender counsel and ringing appeal it will find its way, by the force of its spiritual power, into the heart and sanctuary of every seeker whose hand it reaches.